Ready to have some fun learning sight words? We love sight word activities that let us move and learn and I’ve found 20 different sight word games that you and your kids can play inside. They are the perfect way to practice when the weather is bad outside. Whew! 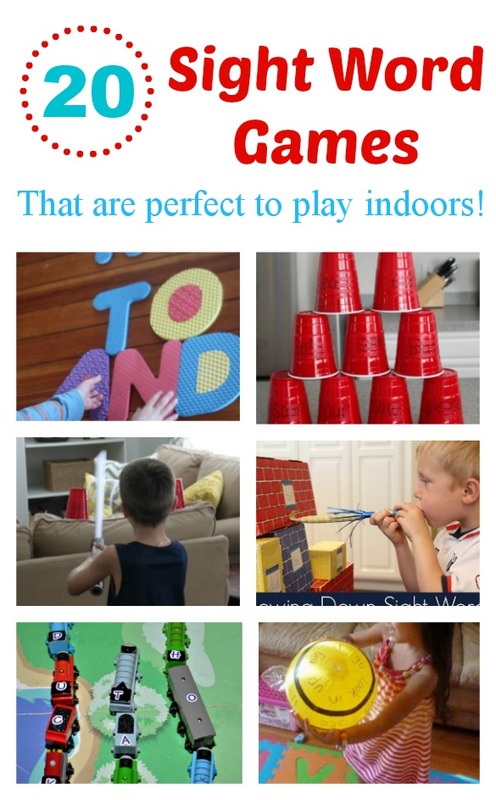 I don’t know about you , but this list of sight word games will keep me busy for awhile! The other Move and Learn co-hosts were busy putting together indoor Move and Learn Activities for kids too, make sure to check them out! Then on the next day you just want to stay in and play you’ll have tons of ways to move and learn with your kiddos! Lots of ideas on our Pinterest board! Thanks for including my sight word drag racing activity in this awesome roundup, Megan!! I love your sight word and reading activities Malia! wow! Coffee Cups and Crayons looks AMAZING with the new look! And I love this round up! Love, LOVE! Pinning and referring to often, I’m sure! Me too! So many fun ones! I have found quite a few activities I think I am going to try with my boys. Thank-you for the round up. I am definitely pinning this!